At his press conference today, President Obama was asked if he endorses boycotts of Arizona by cities and others that object to the state's controversial immigration law. "I'm the president of the United States, I don't endorse boycotts or not endorse boycotts," he replied. "That's something that private citizens can make a decision about." The president reiterated his disapproval of the Arizona measure, which was signed into law last month and goes into effect in July. It requires immigrants in the state to carry documents verifying their immigration status and requires police officers to question a person about his or her immigration status during a "lawful stop" if there is "reasonable suspicion" that person may be in the country illegally. 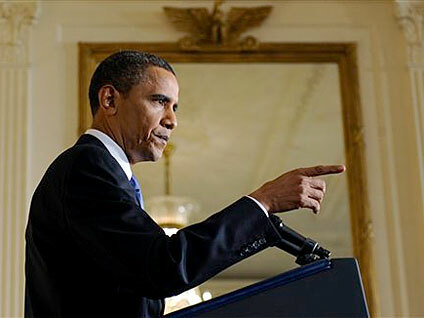 Mr. Obama reiterated his disapproval of the measure at this press conference, complaining about potential risks to civil liberties as well as the potential the measure has to help create a "patchwork of 50 different immigration laws around the country in an area that is inherently the job of the federal government." He also again called for a "comprehensive approach" to immigration reform, one that includes a path to citizenship for illegal immigrants who learn English, pay a fine and "get in the back of the line" when it comes to attaining legal status. The president said his decision to deploy up to 1,200 National Guard troops to the southern border was "not simply a response to the Arizona law," saying the plan had first been drawn up last year. He said the troops will be able to help with intelligence, deal with both drug and human trafficking, and relieve border guards who will be able to then focus on enforcement. He also urged Republicans to meet him not even halfway on crafting reform, but merely "a quarter of the way." He said he could bring most Democrats on board for a reform effort but that the rules of the Senate mean that he must also have GOP support. In a CBS News poll released Tuesday, 52 percent of Americans said the Arizona law was "about right" in its approach to illegal immigration.